I love to explore as much as (or possibly more than) the next person, but it's telling that with each new baby our first family trip has been to Southern California. Most of my husband's family lives within a few miles of each other. 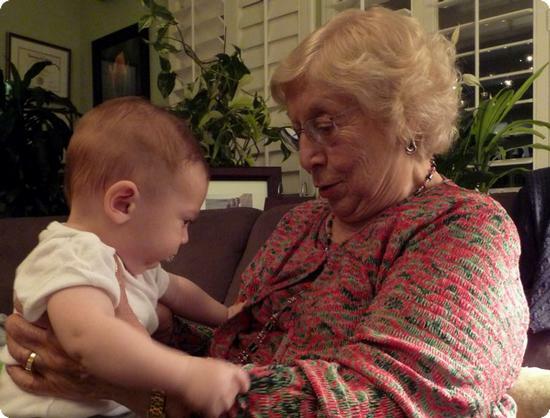 With the 2 1/2 hour plane flight we bring each baby into the fold - and let him or her experience this for the first time: A few precious moments on the lap of my husband's grandmother (mommani). This trip was especially precious as Eilan was named (in part) after mommani's husband - bringing his memory and spirit forward into a new generation. maria on October 16, 2009 at 3:51 a.m. It is such a wonderful thing when your children are so lucky to meet your grandparents! Such a sweet moment you have captured there. Priceless. Amy @ The Q Family on October 16, 2009 at 6:27 a.m. So true!!! There is nothing beat the bond within family. We also try to do the same. It's hard seeing that my family is half way around the world. But it's well worth it. My daughter still remembers her special cousin she met in Thailand and can't wait to go back and see her. That's such a precious moment and picture! Cate on October 16, 2009 at 7:30 a.m. This is the type of photo you want to start and end your day with. It makes me feel all warm inside. kerry dexter on October 16, 2009 at 9:01 a.m.
so great that they get to meet each other. this is a photo [and a moment] to cherish now, and one that Eilan wil when he is grown, too, I am sure. Caitlin on October 16, 2009 at 10:19 a.m.
What a great photo! I love the way they are looking at each other - love at first sight! Heather on her travels on October 17, 2009 at 1:56 p.m.
Dominique on October 19, 2009 at 6:24 a.m.
Tim's sister gave him a print of a photo of him as a baby with his mom and grandmother. He loved getting the photo, and we display it in our living room bookcase. It was fun to see Tim's mom as a young woman, and to see his grandmother (who I never met).